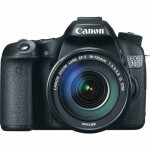 Home / Digital Camera Comparison / Canon EOS Rebel T5 vs Nikon D3200, which is better? In the world of reflex photography we find a myriad of brands and manufacturers, even though the differences among them are usually minima. Today we’ve decided to discuss one of the best gifts anyone can give this holiday: a reflex camera. Here we’ll be focusing on two of the best reflex cameras for beginners: the Canon EOS Rebel T5 and the Nikon D3200. The differences between each brand aren’t huge, though they can be decisive when it comes to deciding which camera to choose. One of the biggest recommendations for anyone wanting to take their first step into the world of SLR photography is the Nikon D3200. This is a device that, despite being a little heavier than the Canon EOS T5 (one of the biggest advantages it has against Nikon) at 20 grams, it’s notably more compact, which the user will be thankful for: 125x96x76 mm vs the Canon 1200D’s 129x99x77 mm. With respect to design, both products have similar, ergonomic designs, but with differences in button placement (perhaps in Canon’s case, once more, we’d have greater ease of use). Nevertheless, despite the fact that the Canon T5 can look like a great choice (which doubtless it is, above all for its ease of use), the Nikon D3200 offers some really important advantages over its competitor that will draw the attention of many aspiring beginners in photography. For example, even though both cameras record Full HD 1080p video (something more difficult to find in pure reflex cameras), Nikon allows connection to an external microphone, which substantially improves the quality of recorded audio. Of course, our chief interest is the photographic capabilities of each camera, so let’s turn our attention to it. The Nikon D3200 has a 24-megapixel, 23.2×15.4-mm APS-C sensor, which is considerably bigger than the Canon T5’s 18-megapixel, 22.3×14.9-mm apparatus. Though this doesn’t always mean better image quality, with these specs the Nikon camera achieves greater image depth and dynamic range, which directly impacts image quality during the day as well as the night (both cameras have integrated flash). 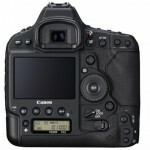 Both cameras have similar ISO sensitivity: from 100 to 6,400 points, though Canon’s able to go up to 12,800. In addition, it has 11 points of focus instead of 9 and a viewfinder that’s 10 percent bigger, which allows users, especially beginners, to take pictures more easily. On the other hand, Nikon’s screen is a bit smaller, but it does offer a resolution practically twice as good as Canon’s, allowing us to see whether our photographs have come out well or not. 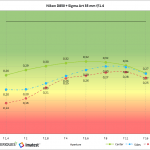 Never the less, though it may seem that the Canon T5 is behind the Nikon, both cameras offer a similar performance, but it’s more than obvious that the Nikon D3200 is a bit better than its rival. One thing to keep in mind is that it’s easier to find cheaper objectives for Canon, which is a bit harder to do for Nikon. Regarding price, the Nikon D3200 with an AF-S DX 18-55-mm f/5.6 VRII objective costs 446 dollars, while the Canon T5 with an ES-F objective costs 449 dollars. Previous Should white balance setups be totally ignored in the taking of RAW photographs? Canon EOS-1D X Mark II vs. Nikon D5 Specs comparison, what’s the difference? 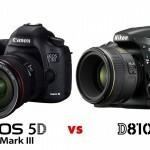 Compare Canon EOS 5D Mark III vs Nikon D810, Which one is worth buying? Canon EOS 70D vs 80D vs Nikon D7200, what’s the difference?